Students research a variety of macromolecules. Using indicator solutions, students record and observe the reactions of proteins, carbohydrates, lipids, and vitamin C to determine their properties. 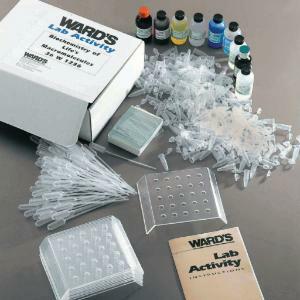 This kit includes instructions and material for 10 setups. Ordering information: This kit includes ascorbic acid powder, iodine solution, vegetable oil, biuret solution, copper sulfate, sudan III, starch solution, microfuge trays, microfuge tubes, and pipets. DI water is needed but not supplied.